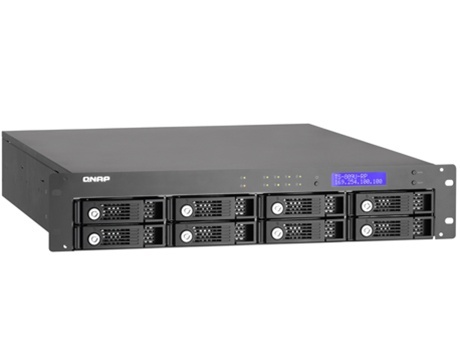 QNAP TS-809U-RP is the new generation 2U rackmount model of the worldwide award-winning Turbo NAS Series, providing superior performance for massive data sharing, powerful all-in-one business server features, advanced RAID data protection, built-in iSCSI target service, AES 256-bit volume-based encryption, and rock-solid hot-swappable hard drive design for business. The TS-809U-RP is featured with Intel Core 2 Duo 2.8GHz CPU and 2GB DDRII memory. It supports RAID 0/ 1/ 5/ 6/ 5+Spare, JBOD, Online RAID Capacity Expansion, and Online RAID Level Migration. 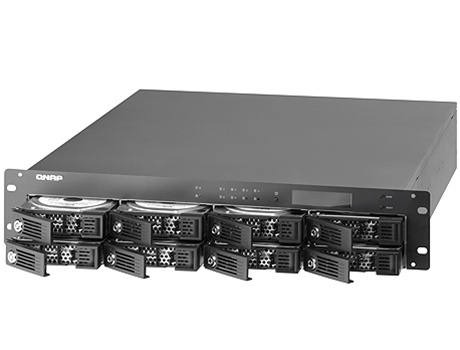 The TS-809U-RP can serve as a NAS and an iSCSI target server. The built-in iSCSI target feature provides an affordable IP-SAN (Storage Area Network) alternative for business. You can set up the NAS to expand the storage capacity for existing application servers, such as database server and mail server in an economic way. Moreover, the "Virtual Space Allocation" (Thin Provisioning) feature is provided which allows you to flexibly allocate the capacity of iSCSI LUN (Logical Unit Number) at the beginning regardless of the physical volume capacity. 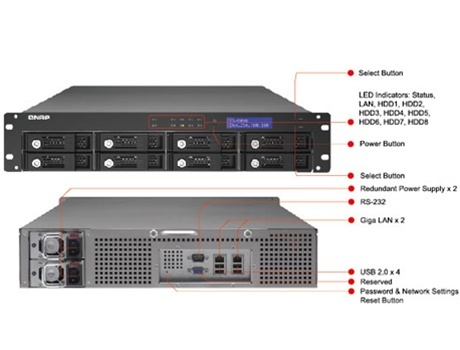 The TS-809U-RP's dominant "volume-based encryption" feature secures the server data by AES 256-bit encryption. Even if the hard drives were stolen, there is no need to fear that the confidential data would be leaked since the data can only be accessed by an authorized password. 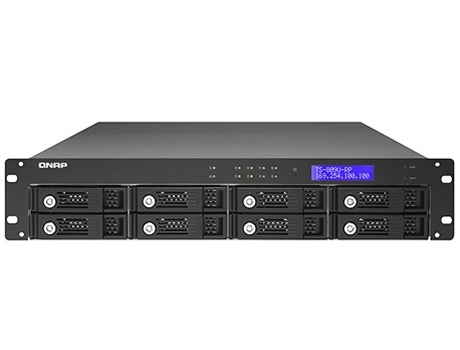 The TS-809U-RP supports file sharing across Linux, UNIX, Mac, and Windows platforms. Versatile business are supported, e.g. 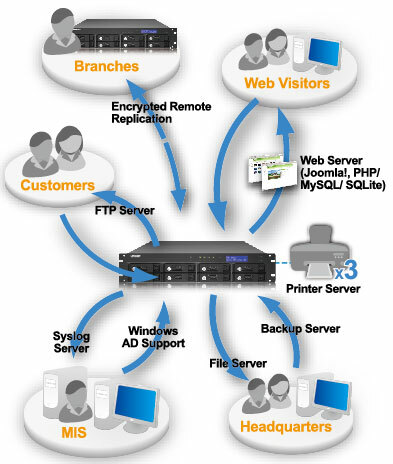 file server, FTP server with encryption, and printer server, PHP/MySQL supported web server, and encrypted remote replication, Windows AD (Active Directory) SSH login and web page SSL login. The handy LCD display on the NAS provides a speedy and easy approach to initialize the NAS and set up the RAID configuration without using any computer. The system information and settings are also displayed for easy management. The schedule power on/off feature is available on the NAS for you to flexibly manage the NAS server's up time according to the working hours. Also, Wake on LAN is supported for convenient remote wakeup of the NAS in the local network. 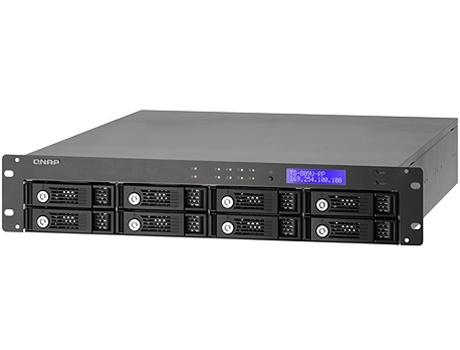 The TS-809U-RP can act as a NAS and iSCSI target server at the same time. 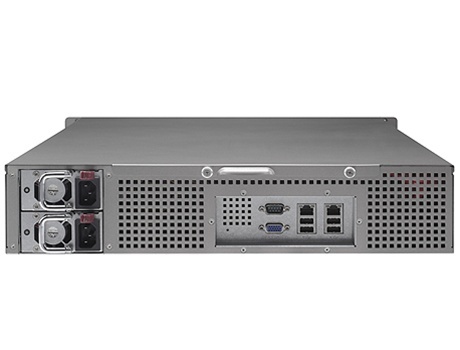 It provides a cost-efficient iSCSI solution to set up an IP-SAN. You can make use of the built-in iSCSI target service to add up to 8 iSCSI devices. Different iSCSI Target LUNs (Logical Unit Number) can be defined as storage expansion or backup destination of the existing application servers, such as database servers and mail servers. Furthermore, the "Virtual Space Allocation" (Thin Provisioning) feature is provided which allows you to flexibly allocate the capacity of iSCSI LUN (Logical Unit Number) at the beginning stage without the limitation of the volume space. When the physical storage capacity of the volume is going to be full, you can easily expand the storage capacity by "online RAID capacity expansion", or adjust/ remove the current unused volume space according to the demands. The flexible schedule power on/off feature is provided on the NAS for you to manage the NAS server's up time according to the working hours. The NAS supports the majority of USB UPS devices (usbhid-ups supported) which enables the users to store the data in time and avoid critical data loss when power outage occurs during data transfer. It also supports advanced stand-by mode setting that you can set the time for the server to enter standby mode when an abnormal AC power supply is detected. When the power resumes, the server resumes to the operation status before the power outage. You can configure the NAS to turn on/ off when the AC power resumes after a power loss. The TS-809U-RP is equipped with two power supply units, each of which is capable of supplying the power for the entire NAS independently. If one of the units fails, the other one will take over to supply the power to ensure continuous operation of the NAS. You can replace the failed power supply unit without turning off the server. The Windows AD feature enables you to import user accounts from AD domain to NAS to reduce the time and effort for account setup, and the users can use the same set of login name and password. The NAS supports batch creation of users and share folders to save your time and effort in account and folder creation. For the security of Windows network environment, you can hide or show network share folders. IP filter control: You can allow or deny specified IP connections to the NAS. 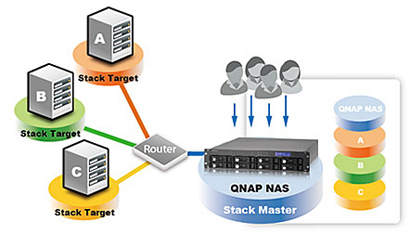 The logs of connections to the NAS via samba, FTP, AFP, HTTP, HTTPS, Telnet, and SSH, and networking services accessed by online users are all recorded. The TS-809U-RP supports four USB 2.0 ports. 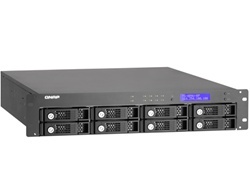 You can connect the external storage devices to the NAS for server data backup or expanding the storage capacity of the server. 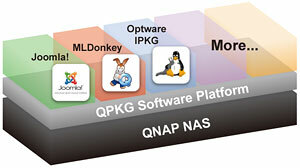 The QPKG software package platform enables you to maximize the usage of the NAS by installing additional software packages developed by the users and community worldwide. This can be done by simple "download & install" clicking without going through any complicated process.